Trusting the Ayatollahs: What's in a Fatwa? Originally published under the title, "Trusting the Ayatollahs." President Obama apparently takes great comfort in the fact that Iranian Supreme Leader Ali Khamenei once issued a religious decree against building nuclear weapons. As Iran continues edging closer to developing nuclear weapons—a major threat to the entire Mideast region, especially longstanding U.S. ally Israel—U.S. 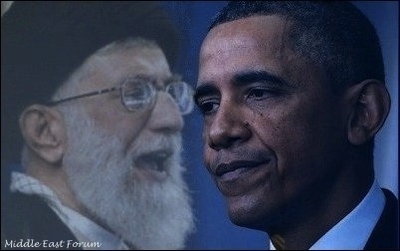 President Obama has come to the aid of the Islamic Republic, by citing an Islamic fatwa no less. In a video recording posted on the White House's website, Obama said, "Iran's Supreme Leader Ayatollah Khamenei has issued a fatwa against the development of nuclear weapons, and President Rouhani has said that Iran would never develop a nuclear weapon." Our negotiations with the world powers are a source of national pride. Yesterday [during the Iran-Iraq War], your brave generals stood against the enemy on the battlefield and defended their country. Today, your diplomatic generals are defending [our nation] in the field of diplomacy–this, too, is jihad. Other administration officials—such as Secretary of State John Kerry and Deputy National Security Adviser Ben Rhodes—have previously referred to the ayatollah's reported fatwa in the context of the ongoing nuclear negotiations with Iran. The Obama administration's citation of this fatwa is utterly wrongheaded on many levels. First, the Islamic doctrine of taqiyya permits Muslims to deceive non-Muslims. Islamic prophet Muhammad himself regularly lied to his infidel enemies, often resulting in their murder (such as the case of Ka'b ibn Ashraf). He also proclaimed that lying was permissible in three contexts, one being war. Moreover, throughout the centuries and due to historic circumstances (discussed here), taqiyya became second nature to the Shia—the sect currently ruling Iran. Speaking of fatwas, Dr. Yusuf Burhami, a prominent Islamic cleric in Egypt, recently said that destroying churches in Egypt is permissible if not advisable—but not if doing so prompts Western infidels to intervene and occupy Egypt, which they could do "because the condition of Muslims in the current era is well known to the nations of the world—they are weak." Burhami further added that circumstance is everything, "just as the prophet allowed the Jews to remain in Khaibar after he opened [conquered] it, once Muslims grew in strength and number, [second caliph] Omar al-Khattab drove them out according to the prophet's command, 'Drive out the Jews and Christians from the Peninsula.'" Islamic doctrine permits Muslims to deceive non-Muslims. And who can forget Yasser Arafat's reference to Muhammad's Hudaybiya pact? In 1994, soon after negotiating a peace treaty criticized as conceding too much to Israel, Arafat addressed an assembly of Muslims and said: "I see this agreement as being no more than the agreement signed between our Prophet Muhammad and the [infidel] Quraysh in Mecca." In other words, like Muhammad, Arafat gave his word only to annul it once his ranks became strong enough to go on the offensive. In short, it's all very standard for Islamic leaders to say they are pursuing nuclear energy for peaceful purposes while they are weaker than their infidel foes—as Iran is today—but once they acquire nukes the jihad can resume in earnest. Then there is the fact that Shia theology is rife with apocalyptic aspirations. An August 2007 report compiled by the Congressional Research Service said: "Ahmadinejad [previous president of Iran] believes his mission is to prepare for the return of the 12th 'Hidden' Imam, whose return from occultation [i.e., "hiding"] would, according to Twelver Shi'ite doctrine, be accompanied by the establishment of Islam as the global religion." Like other Iranians, Ahmadinejad cited the eschatological (and canonical) hadith wherein Muhammad said: "The Hour [Judgment Day] will not come until the Muslims fight the Jews and until the Jews hide behind the trees and rocks and the trees and rocks will say, 'O Muslim, O Servant of God! Here are the Jews! Come and kill them!" Indeed, during a recent speech, supreme leader Khamenei—whose fatwa Obama is now citing—boasted about Iran's uranium enrichment, even as his military commanders shouted, "Allah Akbar. Khamenei is the leader. Death to the enemies of the leadership. Death to America. Death to England. Death to hypocrites. Death to Israel." Yet despite all this—despite the fact that Islamic doctrine mandates lying to infidels; despite the fact that the Shia—Iran's leadership—have perfected taqiyya into an art; despite the fact that Islamic law holds that Muslims should preach peace when weak, war when strong; despite the fact that Iranian leadership openly boasts that its nuclear negotiations are a "jihad" against the infidel; despite the fact that Iran has previously been exposed developing uranium enrichments suitable for nuclear warheads—here is Obama and his administration relying on the "word" of the ayatollah of Iran.